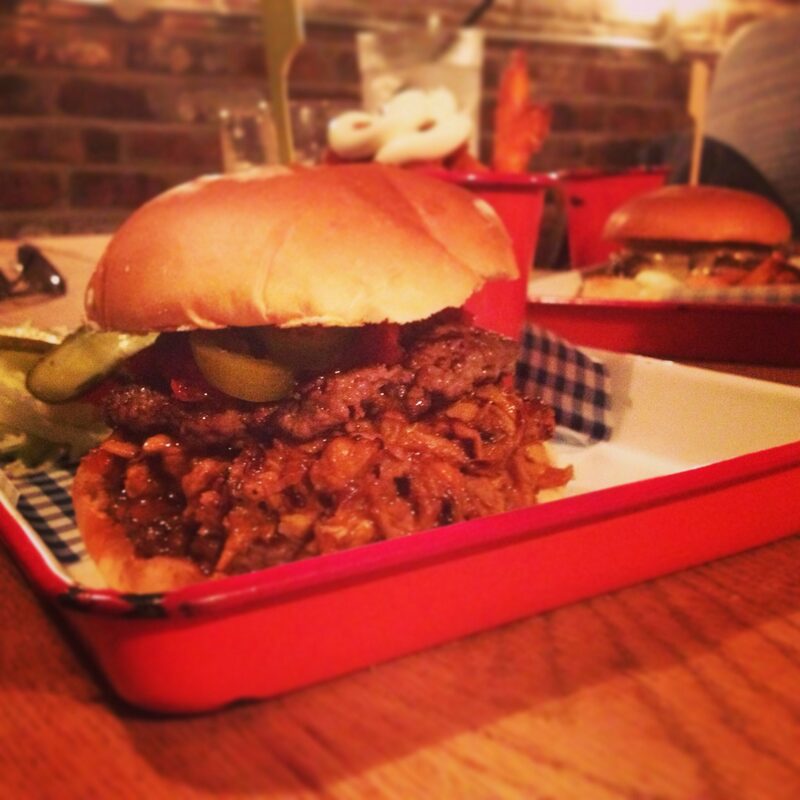 There’s no doubt that Newcastle is going through a food revolution at the moment. There seems to be a new restaurant launch or food festival every weekend. I’m not complaining, as it can only be a good thing for the Toon. The biggest food trend for a while now seems to be Americana & all things Deep South. There isn’t a menu around that doesn’t feature pulled pork, slaw, or sweet potato fries. Luckily for us there are fantastic local independents who do American food with guts and conviction, as opposed to the half hearted efforts adopted by some of the chain restaurants. 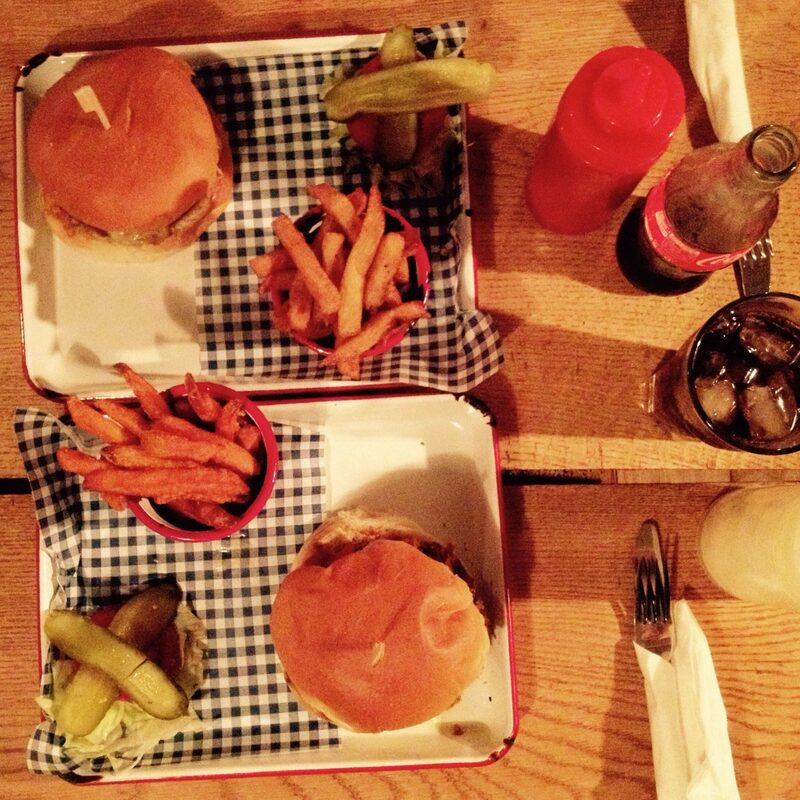 This week we had the pleasure of Monday lunch (best way to cure the Monday blues!) 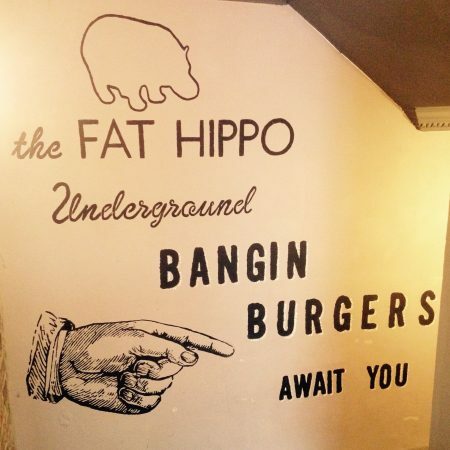 at Fat Hippo Underground. 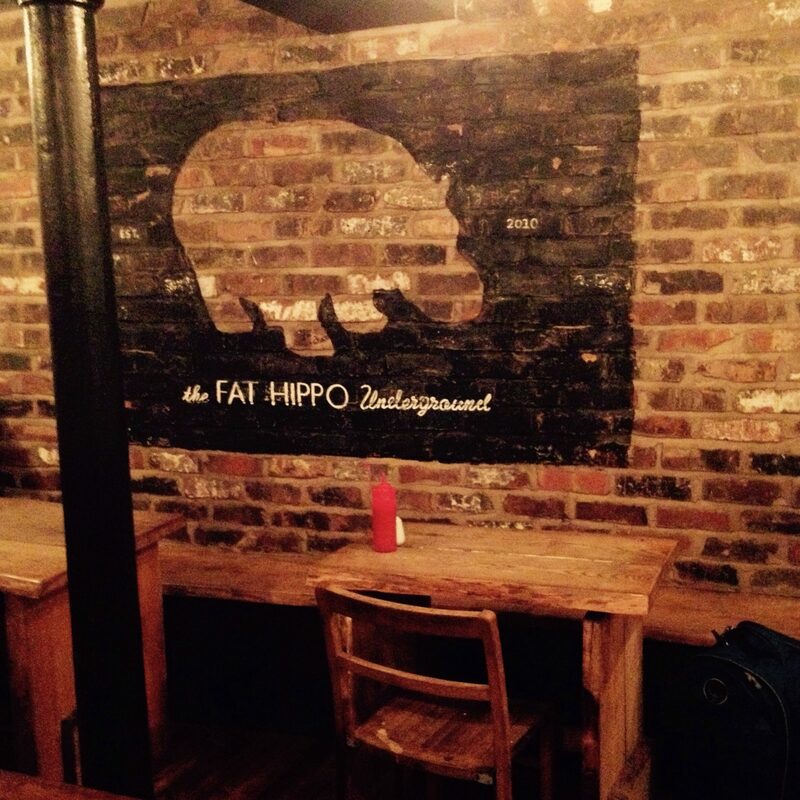 Established in Jesmond in 2010, Fat Hippo has gone from strength to strength, with its Newcastle addition opening last year. For convenience we plumped for Underground, which is just round the corner from the Theatre Royal in a space previously occupied by Starters and Puds. Now for the burgers. We were pushed for time so didn’t order starters, which turned out to be just as well! We opted to order from their main menu rather than the lunchtime specials (great selection of single patty burgers and fries for £5) as we were feeling hungry. Mr Toon Lunch Club plumped for the ‘Born Slippy’ a double 4oz patty topped with rib meat, jalapeños and chilli jam in a brioche bun £10 and he opted to upgrade to sweet potato fries. As I was going down the indulgence route I thought I better do it properly and so I went for the ‘PB&J’. It’s always been my favourite nostalgic sandwich topping, so I thought I’d see how it fared on a burger. A double 4oz patty with crunchy peanut butter and chilli bacon jam £9.50 sounded curiously tasty, and satay sauce works with meat so what did I have to lose?! I went for the standard triple cooked handcut fries. As the Mr had an appointment to get to we asked politely if our burgers could be rushed through and boy did they! We only had to wait 10 mins, top marks. The restaurant was pretty full for a Monday lunchtime but not uncomfortably so, with its cavernous rooms full of quirky purposely mismatched wooden tables and chairs and exposed brick walls a Mecca for trendy students and office workers looking for a satisfying meal. It was a little warm in our corner of the restaurant although a fan was providing cool air in the main room. Our burgers arrived looking enticingly huge, served in a tray with the lettuce, tomato and gherkins on the side, which is a nice touch. The Mr took the first bite (which wasn’t easy given the size of his meat feast!) he was impressed by the tenderness of the meat, which was seasoned and cooked to perfection – served pink in the middle as standard. After a disappointing trip to a chain restaurant which specialises in supposedly ‘Handmade’ burgers in the past, where they were unable to cook the burgers upon request to anything other than cremated it was refreshing to see that by default the burgers at Fat Hippo are served pink in the middle. These guys clearly take their ground beef seriously. The result was burgers which were juicy and delicious. The requisite pulled rib meat was both strong in terms of quality and quantity, and the chilli jam and jalapeños added a nice kick. My burger was quite the revelation. Biting into soft brioche and salty meat was good enough but getting a hit of crunchy peanut butter and then the sweetness of the bacon jam made me very happy. I had a couple more bites before I added the salad, giving my tastebuds another shake up. 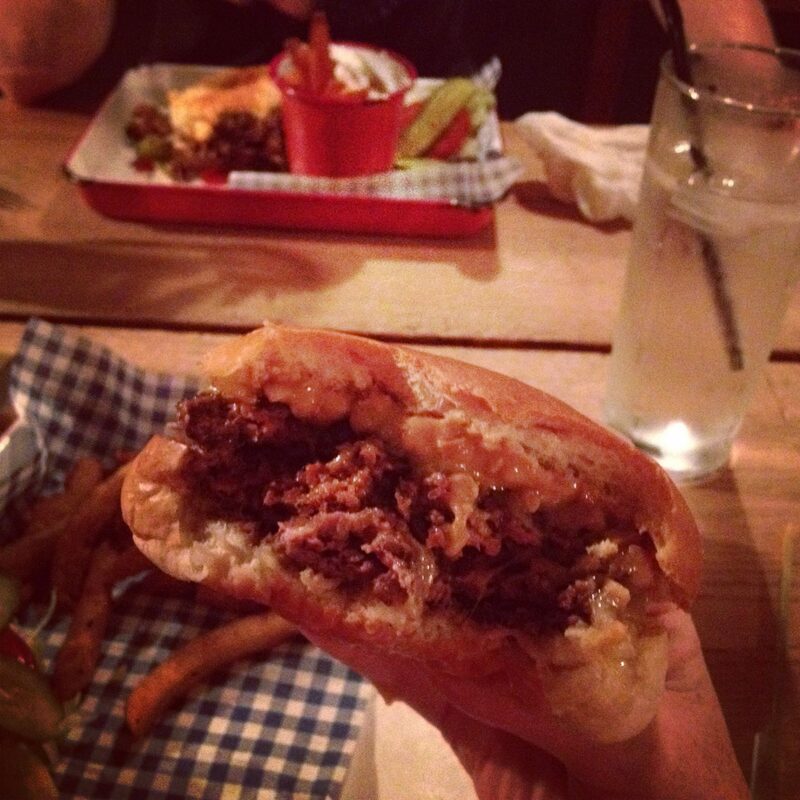 I am now quite convinced that unless my burger has peanut butter on it, I aint eating it! The Mr hit a meat wall 3/4 through his burger and had to give up, I on the other hand have been in training and took mine down no problem. Suffice to say we didn’t need any tea that evening! We finished up and grabbed one of LD’s baby wipes for our very burgery hands. The Mr bemoaned the lack of tooth picks (he takes his dental hygiene seriously) and hand wipes which would have come in handy, but all in all we left with big smiles/ketchup on or faces! 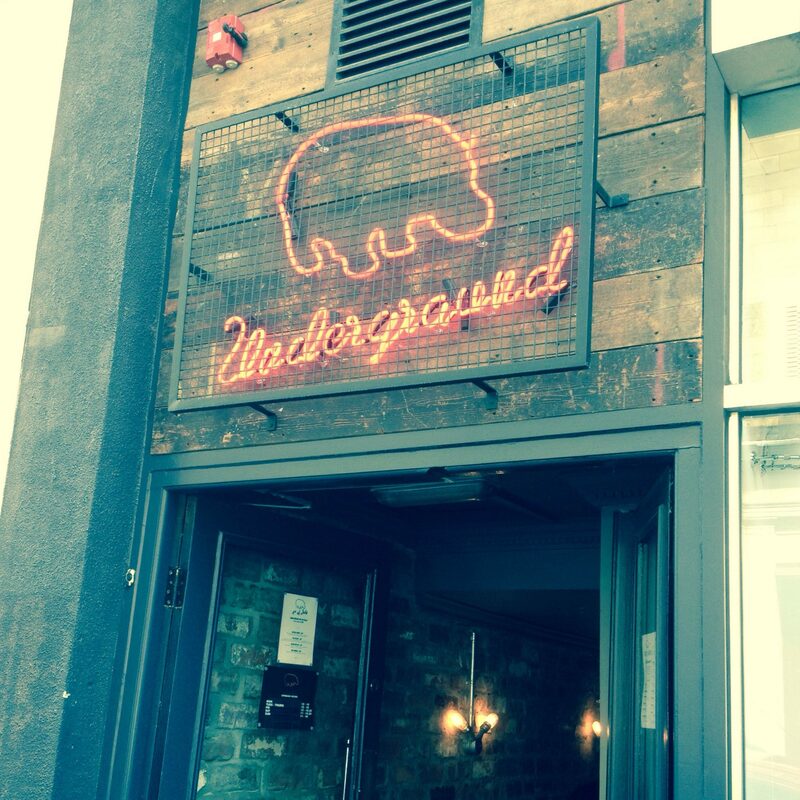 Give one of the Hippos a go, you won’t be disappointed! The Mr and I were provided with a complimentary meal for the purposes of this review. However the opinions expressed in this article are honest and true to experience.